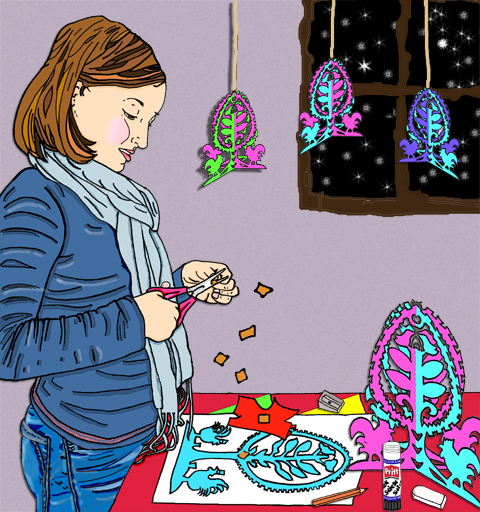 ﻿ Amelia's Magazine | Craft: christmas decorations. This is the third and final Christmas article from Hannah Bullivant- and we're talking decorations. With illustrations by Matilde Sazio and Avril Kelly. So far you have heard me rant about the mass consumerism and waste that is now so ubiquitous with Christmas and I’ve shown you how to make no less than 5 Christmas card designs. Its time to deck the halls with some non-traditional and home made Christmas decorations. I have always enjoyed making Christmas decorations. I had a wonderful art teacher in primary school who once helped us all to make large foam board Christmas Trees. We were allowed to go wild with copious amounts of glitter, sales sequins and poster paint, abortion and some pipe cleaners for good measure (what primary school art lesson is complete without pipe cleaners?!). It was hideous. But still to this day, this foam board Christmas tree that has seen better years is dutifully unpacked and displayed in my family’s house over Christmas. Cringe worthy, yes. But also evidence of the lasting impact hand made items can have on their recipients. Most importantly, you don’t have to spend a penny on Christmas decorations. These ideas are easy and use materials that would otherwise be thrown away or that can be used all year round. Some of these decoration ideas would also make lovely Christmas presents too, double whammy. And not a pipe cleaner in sight. Paperchains. Does this even need a tutorial? Here I used some old wallpaper and brown packaging, cut it into long rectangular strips then glued together to form a chain. You could use anything here- maps, book pages, colourful magazine pages etc. I used some old cupcake cases amongst the newspaper. 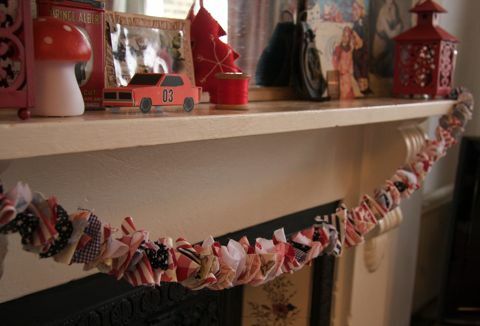 The fabric garland was made from scraps of fabric, and was put together in exactly the same way as the newspaper garland, apart from I folded the circles into semi-circles before threading them onto string. 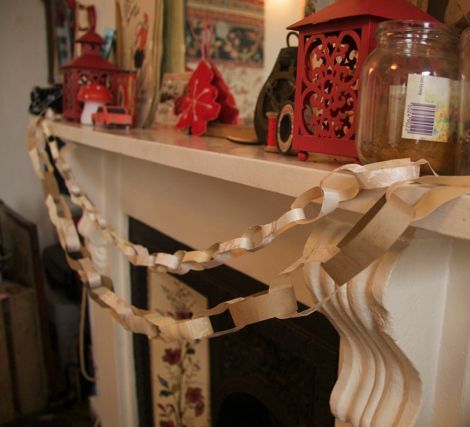 Paper chains, newspaper and fabric garlands look lovely wrapped around trees or draped over windows, doors or fireplaces. Don’t have space or money for a tree? Fret not. You just have to get a bit creative. I was looking at my Polaroid’s last week and decided to create a tree with them. Took me all of 4 minutes. So, you have garlands-a-plenty to wrap around your tree. If its still missing something perhaps you could make some origami paper trees, like I demonstrated on Monday. Or think a little more out of the box. Some of the coolest tree’s I’ve seen were decorated with non- Christmas items. Like children’s wooden building blocks, vintage button cards, old photographs strung with thread, action figures, etc. 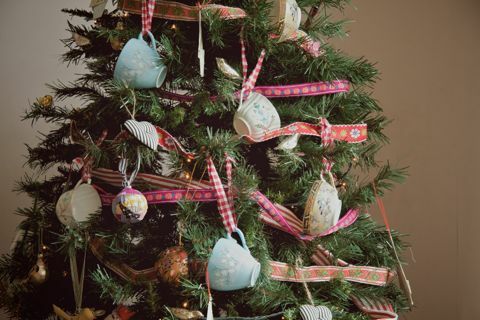 My tree is currently adorned with tea-cups. I collect old tea sets so there was no extra expense and after Christmas they go back in my tea cupboard to be used all year long. If you decide to use any of the ideas here then do let us know in the comments, I’d love to see other peoples creations. 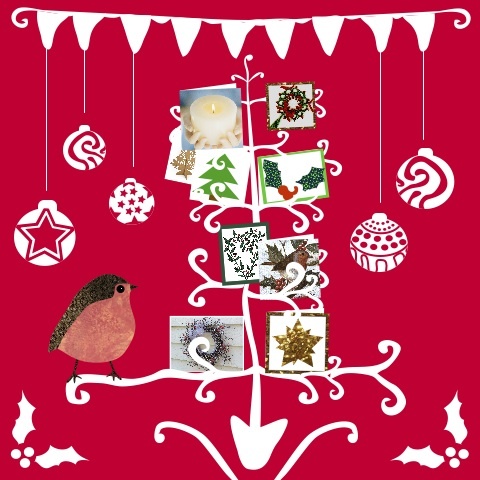 Here’s wishing you a very happy, craftalicious Christmas! Peace on earth and goodwill to all? Bah humbug. Omigod, is that chair from the union?! I spent nearly every day for two years glued to one of those babies. I am very jealous indeed! Oh, and great tutorial Han. 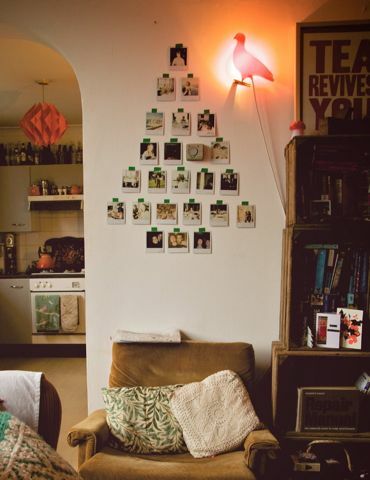 I think its a great idea just to hang whatever you can find on the tree. Well spotted! haha! It certainly is! we moved offices and Doreen wanted them out so bagsied one, and I love it, so comfortable and a lasting souvenir of the union! Also- can you see your handmade christmas card Elizabeth?! on the crates? A shining example of of a crafty home made christmas card! I’m famous! Haha…yey for my attempt at crafting a Christmas card. I was too busy being jealous about the chair to notice it in the photo. Silly me. But those chairs were soooooo comfy. Probably why I spent so much time in Dav’s office! Love the tea cup decorations! Thanks LoveCupcakes and Mina. Yes, this should save lots of money!